Are you planning to invest in property? 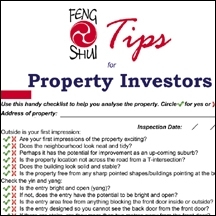 Check the external features of the property. Ensure the bed is well placed. I’ll be in Melbourne and Sydney in May, and the Gold Coast in early June 2017…If you’d like to make a personal appointment, I’ll see you then! Are you ready to apply Feng Shui to your home or business? Master Jodi offers a free one-hour strategy session.